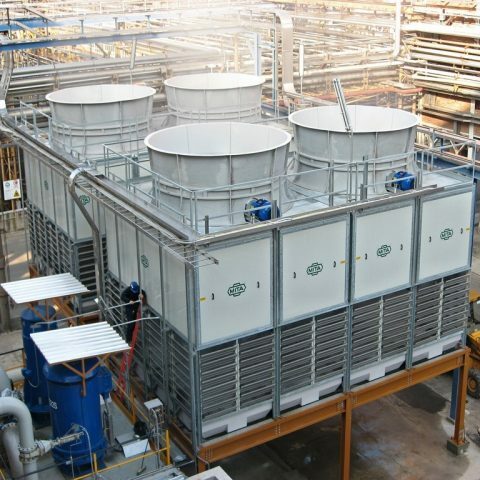 Making use of a simple, natural physical principle, thanks to which the forced evaporation of a minimal quantity of water produces a lowering of the temperature of the main mass of water, the evaporative cooling towers represent the most widely employed system of cooling in civil and industrial applications. 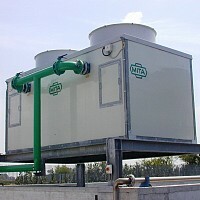 The minimum outlet temperature theoretically obtainable from an evaporative cooling tower is that of the wet bulb temperature of the atmospheric air as measured in the zone in which the unit is installed: this is usually much less than its dry bulb temperature, on which other types of cooling system are based (and with which one can obtain a cold water leaving temperature of 3-5°C higher than that parameter). 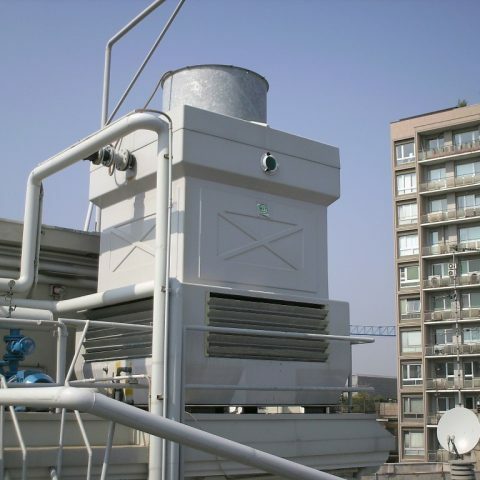 In practice, owing to the effects of performance factors related to air saturation, an adequately sized cooling tower manages to cool the circulated water down to a temperature 2-3°C above the wet bulb temperature. 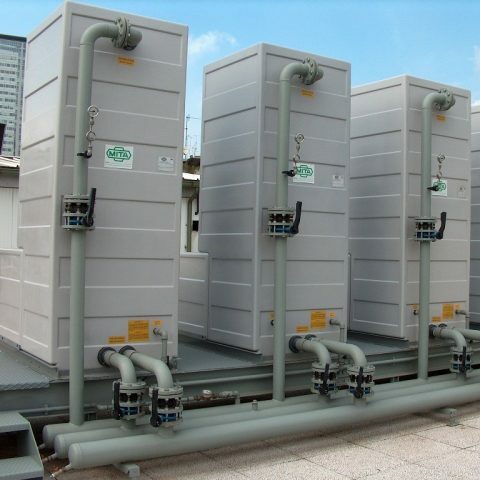 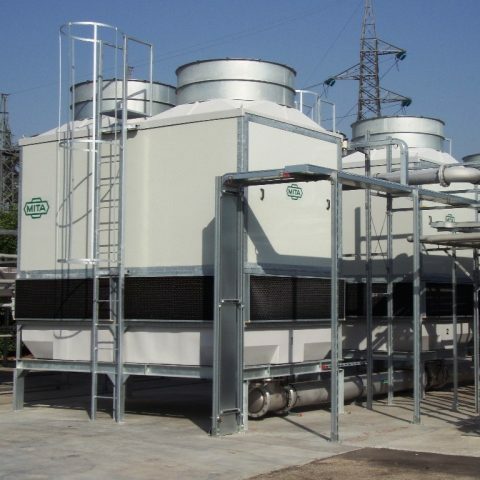 The product range covers a large number of models subdivided into: - open cooling towers with axial fans (PMS, PMD, PME-E, PMM) for a cooling capacity range between 18 kW and 14 MW (indicative nominal values referred to a 5°C temperature range); - open cooling towers with centrifugal fans (MCT) for a cooling capacity range between 18 and 7300 kW (indicative nominal values referred to a 5°C temperature range); - closed circuit towers and evaporative condensers with axial fans (MCC, MCE) with heat rejection capacity ranging from about 80 to 1.500 kW. 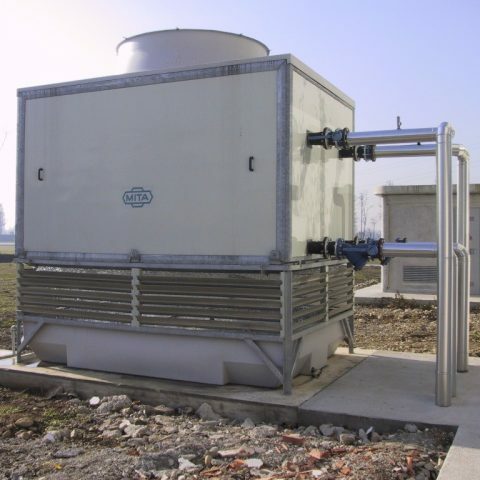 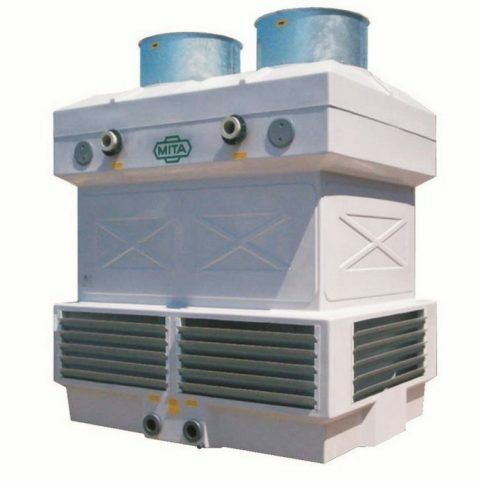 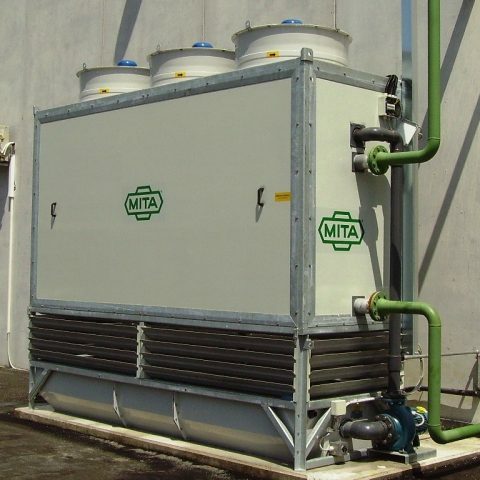 Distinguishing characteristics of Mita cooling towers: - main casing, water collecting basin and lid made of non-corroding material (fiberglass), - internal components made of plastic, - light-weight, - external surface protection with a gel-coat resistant to UV radiation, hot and cold water, abrasion caused by weathering and by chemicals, - self-supporting structure for certain series, hot-dip galvanized metallic framework and sandwich panels, - exclusive nozzle design, with large passages to guarantee non-clogging and a full cone spray, - Siemens motors with IP 65 protection, - high performance, low electrical power input due to multi-blade axial fan directly driven by the electric motor, - electric resistance anti-freeze heater and related thermostat in the basin, - on-site assembly is extremely simple and rapid, due to delivery of factory pre-assembled sections.